MTI is one of the first independently owned physical therapy centers in the area to introduce aquatic therapy. Aquatic therapy uses the unique physical properties of warm water to promote healing and improve function. Aquatic therapy has been proven to be helpful for patients with arthritis, fractured bones or weight problems, not to mention chronic pain conditions such as fibromyalgia. 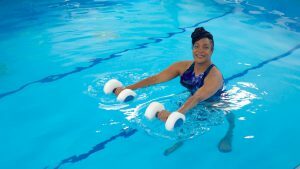 As joint stress decreases in the water, the patient’s ability to move and exercise becomes easier and less painful. Our large aquatic therapy pool, located at MTI-Warren, offers low-impact exercise therapy. It’s gentle on your joints and improves circulation to your muscles. At Michigan Therapy Institute, our Physical Therapists have helped thousands of people with all types of injuries utilizing aquatic therapy. We can help you too! Tell your doctor that you prefer to have your therapy at Michigan Therapy Institute, a highly reputable well known clinician privately owned clinic, where you will receive one-on-one effective and compassionate care, all of the time, unlike a hospital, where you may be treated as a number. Ready to Splash in our Pool and get well?